In November 1816, William Poole acknowledged the additional land that the U.S. Army at Fort Norfolk had taken from the family property. 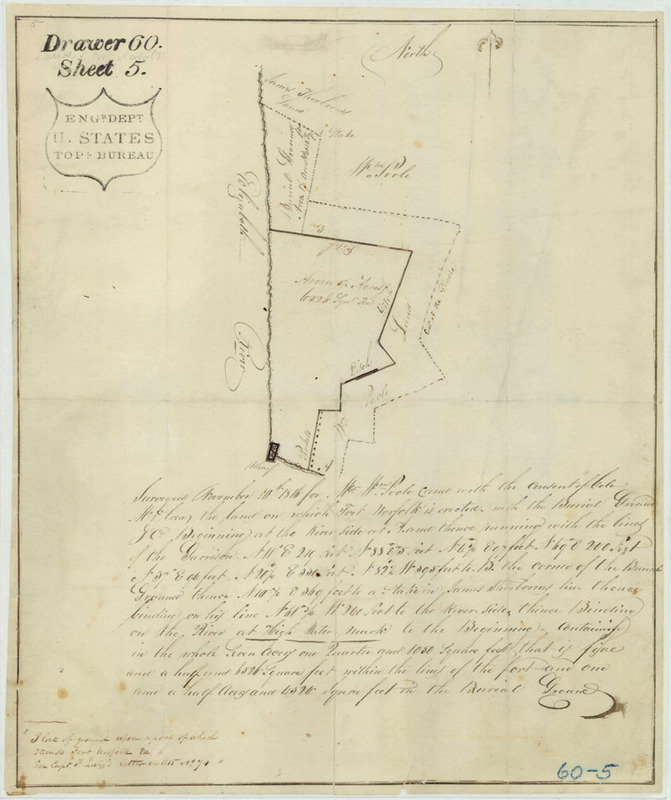 Lieutenant Colonel William McRea, the artillery commander at Norfolk harbor, authorized a military surveyor to prepare a plat of the new boundaries (Engineer Department Topographic Bureau [EDTB] Drawer 60, Sheet 5) (see above). While the plat does not depict the fort, it does show several associated features that might prove archaeologically significant. There is no indication that the plat accompanied an actual deed of sale, but the document does state that the survey was conducted at Poole's request. During the War of 1812, camp sickness had apparently necessitated the creation of a burial ground on the north side of Fort Norfolk property. The 1816 plat shows the ditch surrounding the fort as well as pan of the palisade. After the war, a portion of Thayer's palisade may have been removed to provide easier access to the fort proper. The palisade posts were marked as "pickets” just east of the wharf. The plat also indicates that the ditch surrounding the fort marked the property line and that the glacis had been extended onto the Poole property. The hatched line denotes the "foot of the Glacis" (EDTB Drawer 60, Sheet 5) (see above). The burial ground was situated above the northwest comer of the fort between the property of William Poole and James Thorborne. The land within the cemetery took up "one and one half acres and 4524 square feet." The Fort Norfolk property, including the burial ground and glacis, now comprised "Seven acres one Quarter and 1050 square feet," substantially more than the 4.31 acres that the U.S. government had originally purchased from Edward Poole (EDTB Drawer 60, Sheet 5) (see above).